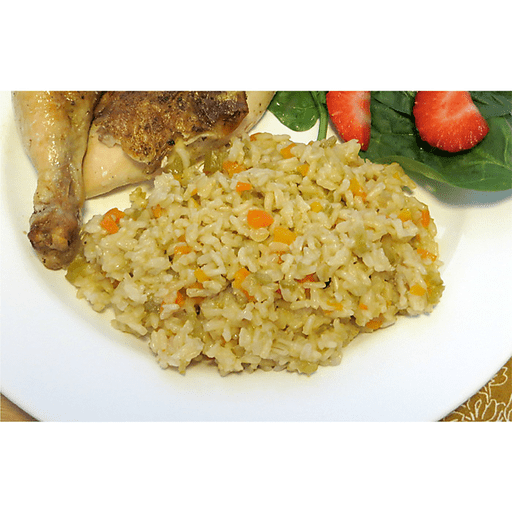 In this super simple recipe, whole grain brown rice cooks with chopped veggies and flavorful broth to create a classic side dish that even the little ones will love. Creamy, delicious, and reminiscent of those seasoned rice packets found in the grocery aisles, this Savory Rice Pilaf is a healthier take on a traditional side… no packet required! 1. Heat canola oil in a medium-sized pan over medium-high heat. Add the diced vegetables, cooking until onion becomes translucent. 1. Stir in the brown rice and broth into the softened vegetables. Bring to a boil. Cover the pan and reduce heat to low. Let simmer for 40-50 minutes or until and all of the liquid is absorbed. 1. Fluff rice with a fork and serve immediately. Calories 230, Total Fat 5g (Saturated 0.5g, Trans 0g), Cholesterol 0mg, Sodium 470mg, Total Carbohydrate 42g (Dietary Fiber 3g, Sugars 3g), Protein 5g, Vitamin A 80%, Vitamin C 20%, Calcium 4%, Iron 6% *Nutritional values are an approximation. Actual nutritional values may vary due to preparation techniques, variations related to suppliers, regional and seasonal differences, or rounding.